All the exposures I have taken for this object are used. Total exposure time is now about 20h together. Two camera lenses was used to capture the data, a Tokina AT 300mm f2.8 and a Canon EF 200mm f1.8, both lenses was used at full aperture. 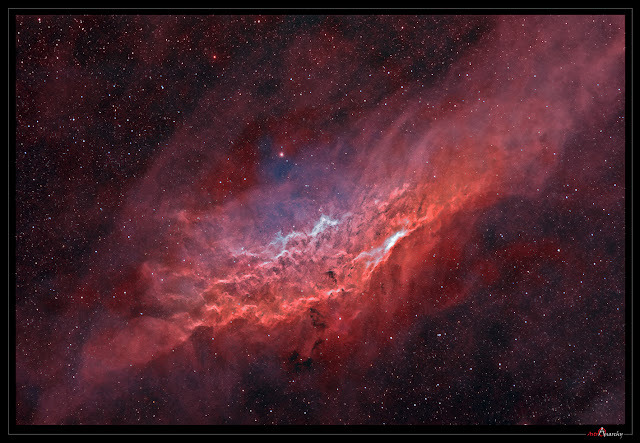 NGC 1499, the "California Nebula" locates in constellation Perseus. Distance is about 1000 light years. The nebula covers about 2,5 degrees of sky. RA 04h 03m 18.00s Dec +36° 25′ 18.0"
Narrowband data was used for Star colors this time, mixture of channels was the same as in first "natural" color composition image here. There is a formation at Seven a clock, kind of half circle, it might be an old uncategorized planetary nebula?